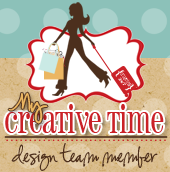 Welcome to another fabulous My Creative Time 3D Wednesday! I am so excited to share my project for you today! I have been working on this for a few weeks now and I'm finally done with it! I bought this house from Hobby Lobby. Its one of those paper mache houses that can be altered. I added a ton of stuff I had left over from one of my kids science projects. I used a lot of fake grass and weeds that are normally used for missions. I painted the house black and added texture to the roof top. I'm planning to make a mini album to put inside the house. I made the fence out of popsicle sticks and added halloween webs. I added a bunch of MCT stamps and dies to decorate the house. There are ghosts and pumpkins, just to name a few! I just love how this turned out! It was a lot of work but it was well worth it! Thank you for stopping by today! Make sure you visit the rest of the design team for more inspiration. Big crafty hugs! OMG your scary mansion is wicked awesome you sure did do lots to your house. You truly are so clever and talented I agree with your hubby you are out of control but in such a wicked awesome way. My gosh you sure did trick out your house and girl it's unbelievable. there's so much to see and enjoy. You didn't miss a beat you truly are ever so clever and extremely talented I do have to say you are doing what you're supposed to do and aren't we lucky you share what you do and how you do it. I am in love with your creation. I truly am in awe of what I just saw! !1 WOW!! WOW!! WOW!! OH WOW...Nancy...this is just WOW!! Amazing! I SO love everything you did here...what an awesome project! Loooove it!!!!!!! I love it! I like how you reused left over material from other projects. There is so much detail,its unbelievable.It makes me want to make something like this.... now I know what I'm doing this weekend. Your haunted house is so cool! The ghost die worked perfectly and I love how you used all the small Halloween stamps too. So fun! I bet your kids love it! Hi Nancy, such a great idea you have given me! This is wonderful! WOW that is AMAZING. Love all the details. FANTASTIC job. Awesome! Super job and I bet the kids loved it too!